The last time the Malheur region of Oregon made the national news, it was the 19th century, and it was yet another story of armed occupation and mistrust. The Paiute people living on the Malheur Reservation were caught in the middle of a 1878 war between the Bannock people and the U.S. military, during which a young Paiute woman called Sarah Winnemucca worked as a translator and diplomat. The military commended Winnemucca for her skills and bravery during the Bannock War, and had promised her that the Paiute could soon return to Malheur Reservation. That promise was broken almost immediately. The Paiute and the defeated Bannock set off on a harrowing winter march to Yakima Reservation in Washington Territory, where Indian agents regularly abused and starved the new occupants. Winnemucca did what she had done many times before, writing indignant letters to the newspapers, to U.S. Army generals, to the Bureau of Indian Affairs. 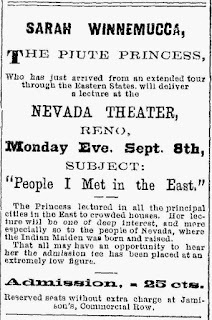 But after Yakima, she decided to return to San Francisco, a place where she and her father and sisters had performed as "Indian princesses" on the stage. 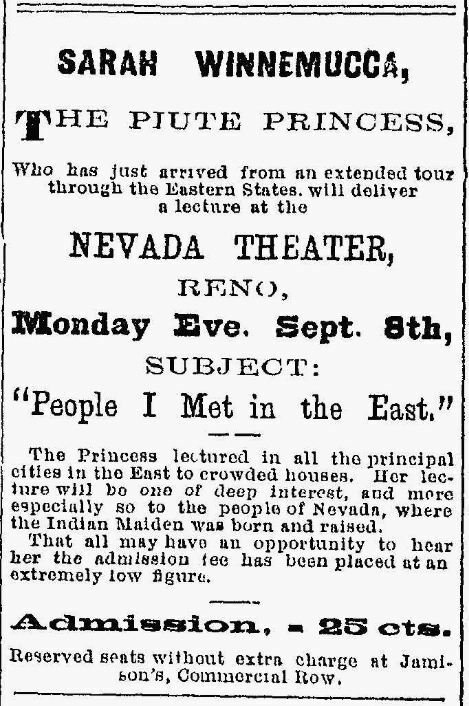 Her new "performances" at Platte Hall in the fall of 1879 brought down the house. 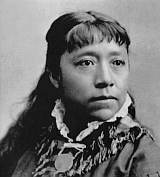 Without notes and with a theatrical, humorous and passionate flair, Winnemucca began the series of lectures on the horrifying conditions of Indian reservations and the depravity of reservation agents that made her one of the best known Native American women of the 19th century. "Sarah's lecture was unlike anything ever before heard in the civilized world," the San Francisco Chronicle raved in its coverage. "Eloquent, pathetic, tragic at times; at others her quaint anecdotes, sarcasms and wonderful mimicry surprised the audience again and again into bursts of laughter and rounds of applause." Winnemucca's career as an activist and orator soared from that point, and she went on to testify before Congress, speak before the Secretary of the Interior and President Rutherford B. Hayes. Boston sisters and social activists Elizabeth Peabody and Mary Peabody Mann (widow of educator Horace Mann) brought Winnemucca to the East Coast to lecture and to encourage her to write her autobiography. In the early 1880s, Winnemucca delivered over 300 speeches in Boston, New York, Philadelphia and Washington, D.C. The full texts of her lectures were not reprinted, although some the material in her autobiography came directly from the speeches. But newspapers like the Chronicle often would quote extensively from the speeches, giving us a taste of how these lectures must have sounded to the people who, as Winnemucca noted, "don't know what the Indians have got to stand sometimes." "Oh, for shame! You who are educated by a Christian government in the art of war…Yes, you, who call yourselves the great civilization; you who have knelt upon Plymouth Rock, covenanting with God to make this land the home of the free and the brave. Ah, then you rise from your bended knees and seizing the welcoming hands of those who are the owners of this land, which you are not, your carbines rise upon the bleak shore, and your so-called civilization sweeps inland from the ocean wave; but, oh, my God! Leaving its pathway marked by crimson lines of blood and strewed by the one of two races, the inheritor and the invader; and I am crying out to you for justice-yes, pleading for the far-off plains of the West, for the dusky mourner." "You take all the nations of the earth to your bosom but the poor Indian…who has lived for generations on the land which the good God has given to them, and you say he must be exterminated [Thrice repeated, and deep passion, and received with tremendous applause.] The proverb says the big fish eat the little fishes, and we Indians are the little fish and you eat us all up and drive us from home [cheers]. Where can we poor Indians go if the government will not help us? If your people will help us, and you have good hearts, and can if you will, I will promise to educate my people and make them law-abiding citizens of the United States [loud applause]. It can be done-it can be done [cheers]. My father, Winnemucca, pleads with you that the guilty shall be punished, but that the innocent shall be permitted to live on their own lands in Nevada…We want you to try us for four years, and if at the end of that time we don't learn, or don't work, or don't become good citizens, then you can do what you please [cheers]." Don't shy away from vivid words: There's a theatricality and a cadence to that first quoted section that probably wouldn't work as well in the 21st century as it did in the 19th century, when speakers connected with their audiences in a more intimate, physical ways . But I think alliterating words like "inheritor" and "invader," the idea of white settlers pushed ashore by the ocean wave, and the crimson pathway sound just as powerful today. Try speaking without your notes: Several newspaper accounts marveled at Winnemucca's eloquence without notes. Not every speech should be extemporaneous, but there can be some good reasons for setting aside a written speech--including connecting with your audience and letting your passion come throughout in a personal story. TED speakers who memorize their talks report that they feel a greater energy in leaving their notes behind. Know the history of silencing women speakers: "I will expose all the rascals. I will save nobody," said Winnemucca in San Francisco. "I will name the paths, the officer, the Agent, and not say I'm afraid to mention his name." Those agents fought back in a time-tested way, by smearing Winnemucca's character as a woman. Yakima agent William V. Rinehart, among others scalded in her lectures, pointed to Winnemucca's divorces as proof that she was "drunk and adulterous" and too scandalous a figure to be speaking to proper white audiences.